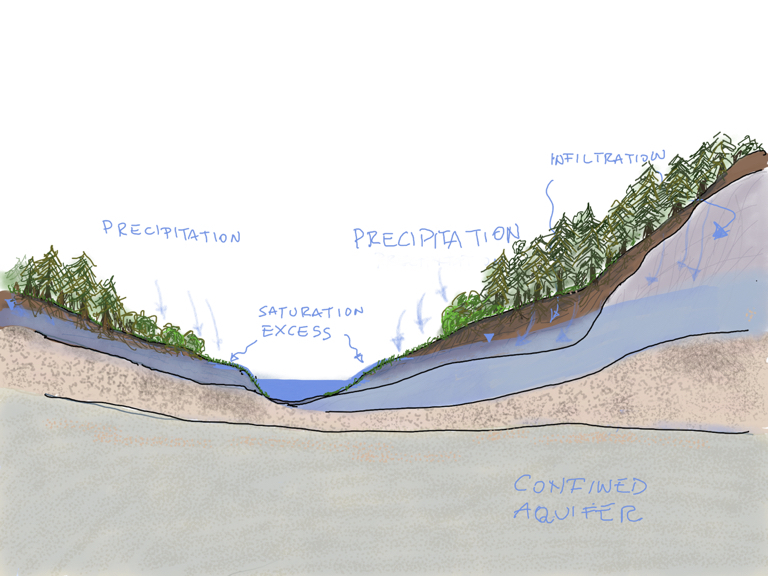 My reflections and notes about hydrology and being a hydrologist in academia. The daily evolution of my work. Especially for my students, but also for anyone with the patience to read them. Thomas Dunne (GS) came to Trento one year and a half for research with a colleague. In the ocasion he gave a seminar on his research about Amazonas river that I recorded. I had the permission of posting it after the publishing of a paper that was under submission at that time. Now the paper is accepted and I've got the permission to go ahead. The seminar is very enjoyable anf you will like it. 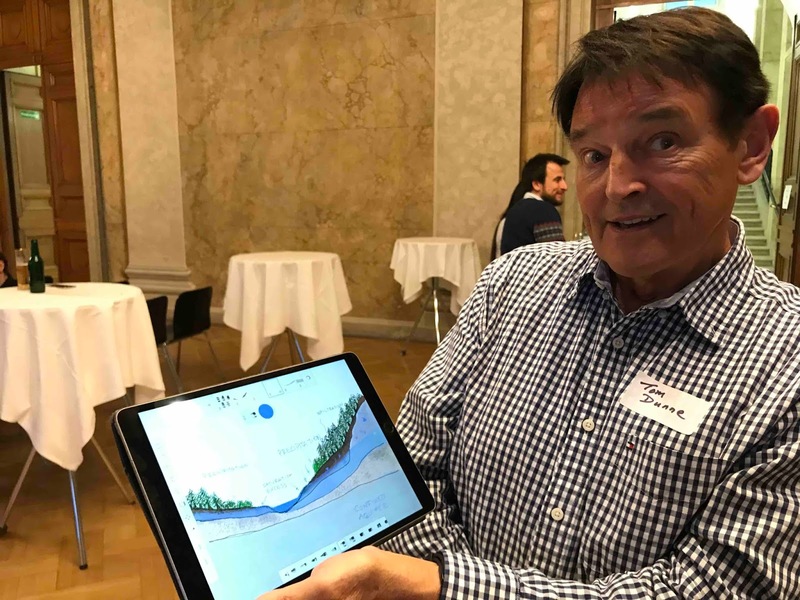 Since 10 year, the Saturday after the EGU meeting, Guenter Bloeschl (GS) organizes at TU Wien a meeting of hydrologists called the Wien Hydrology Symposium. This year among the guest there was Thomas Dunne (GS) who talked about fluvial geomorphology. Tom is universally known for his work as hydrologist and geomorphologist (both of them) and students will realize that saturation excess mechanism of overland flow formation take its name from him as Dunnian runoff. Here you can find a picture of him with my own representation of "his" process. My draw is also here below for free usage (I have also the image for the Hortonian runoff though). 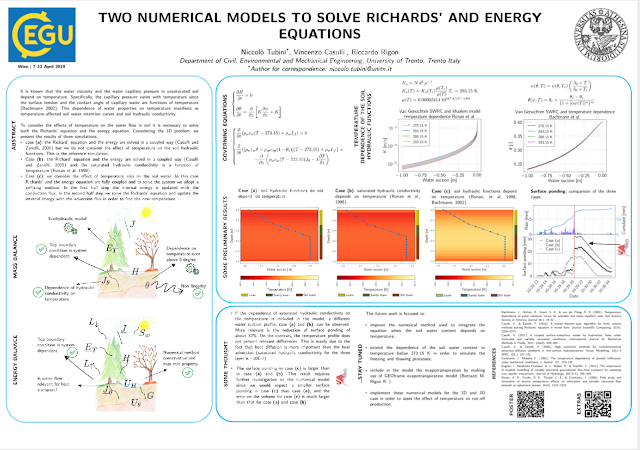 This contribution discusses two methods of integration for Richards equation and the heat equation (for T > 0 centigrades). Results are encouraging and show that temperature could be important to get the right runoff production. The model uses new numerics based on work by Vincenzo Casulli and Paola Zanolli, called nested Newton. The original poster is obtained by clicking on the figure. 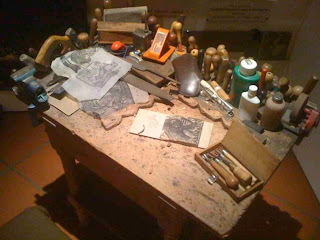 NewAge in action is presented here as mainly the work of Marialaura Bancheri and her co-workers in Basilicata region. If you aske for applications, here you get them! 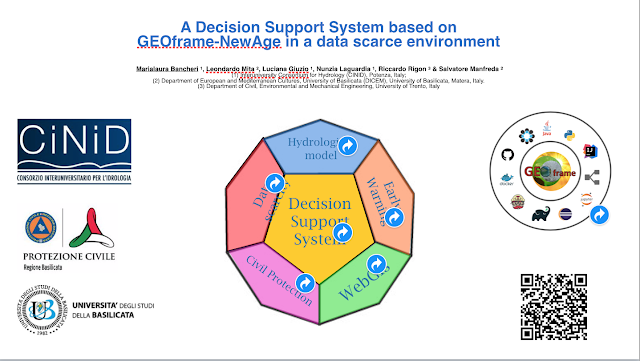 By clicking on the figure, you can get the slides. The presentation at least make a list of them, and give reference to more information. Click on the Figure for the presentation. Enjoy. You can do better than usual in modelling by using the Schymanski-Or formulation of the evapotranspiration solution obtained by assuming the Penman ansatz. 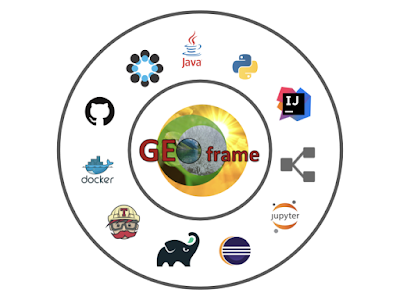 Here you can find some work related to it made within GEOframe. I am not co-author of the poster, he is Michele Bottazzi, one of my Ph.D. students. But it is in line with our common findings. Please find the full version of the poster by clicking on the Figure. 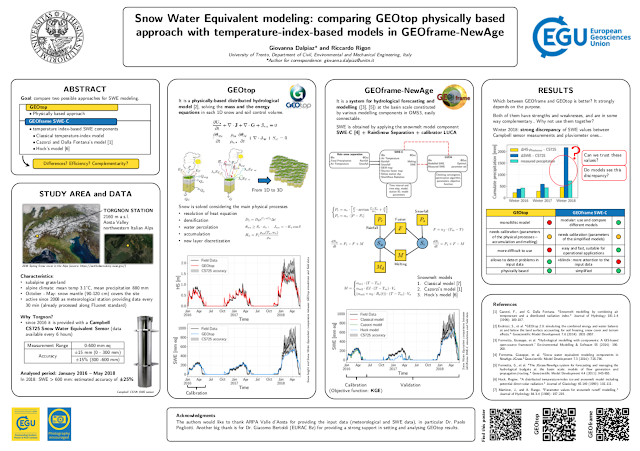 In the work for a new version of GEOtop snow modelling, we are comparing here the results given by the GEOtop 2.0 snow model with those by the GEOframe components. Comparison is made in one point and, in both cases, requires calibration which is, however, made on different quantities for the different context. To get the results give a look to the poster. 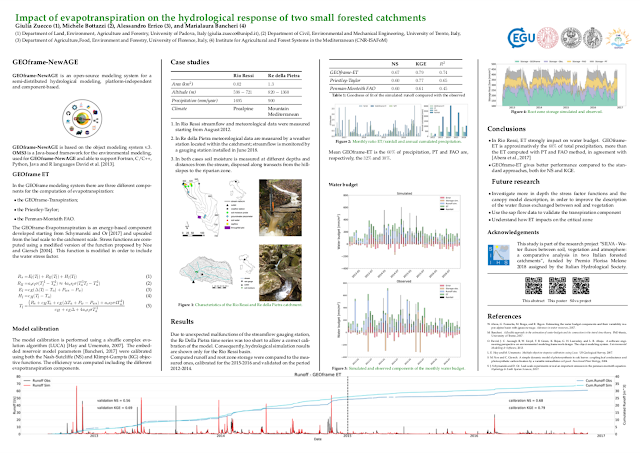 The work uses the data given by ARPA Val d'Aosta retrieved at Torgnon site. Please find the high resolution poster by clicking on the figure above. The Geopaparazzi family upgrades... new server and apps! The web address was cut from the address of the R post. AboutHydrology Blog is licensed under a Creative Commons Attribution 3.0 Unported License. Jan Verkade | hydrology. flood forecasting. predictive uncertainty.